"Youth engagement is about empowering all young people as valuable partners in addressing and making decisions about issues that affect them personally and/or that they believe to be important." Youth engagement happens on a continuum, and there is always room to move to more genuine levels of engagement. As you progress along the continuum, young people’s roles shift towards increased levels of decision-making and leadership. 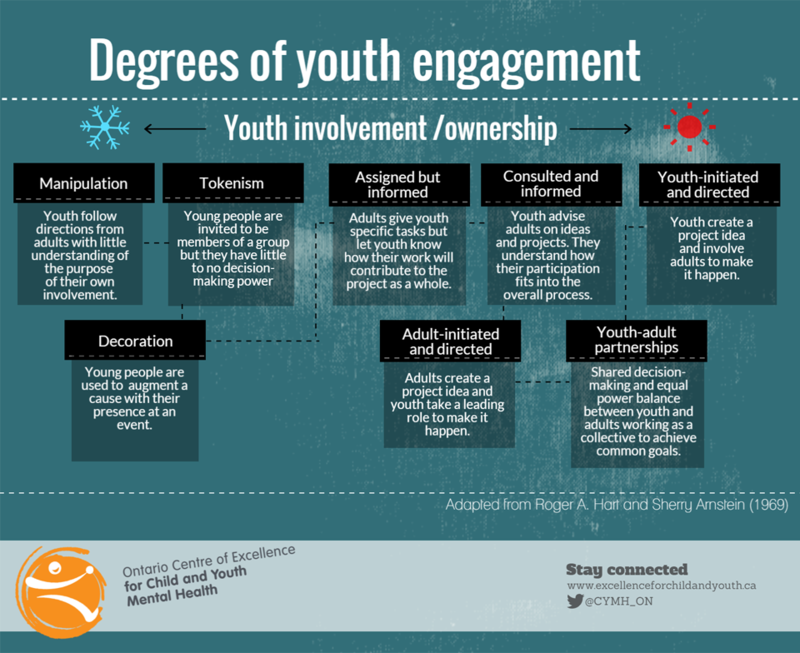 It is important to distinguish between dis-engaging activities that view young people as passive recipients of services and engaging activities that recognize youth as equal partners in their care. Focusing on things which are outside of themselves gives young people the opportunity to feel connected to something that has positive effects on the people around them or their community as a whole. Youth gain a sense of purpose as they see the impact they have on their communities and relationships. Engagement is about more than just participating in an activity group, it's about being fully present and aware and of what thoughts, feelings, actions and beliefs they have to contribute. What level of engagement is possible? What is the best way of facilitating engagement? What strategies can you implement to elevate engagement? We asked youth on our training team what youth engagement means to them. See how meaningful it is to them.